Entrusting – Wake Up and Laugh! Several people have asked me to talk more about entrusting, and what Daehaeng Kun Sunim means by it. Let me start off by saying that entrusting is probably the second-most important aspect of all spiritual practice. There’s so much that revolves around this topic, so I’ll just jump in, and if you all have questions unanswered, let’s continue the topic in the comments section. The easy explanation is that it means trusting your root. It’s trusting your inherent Buddha-nature, and turning over to it everything that arises, along with the things you get hung up on. To be even more accurate, you’re returning them back to the place they came from. Everything arises from there, so that’s the place they need to be returned to. If you want the answer to a problem, look for it at the source of the problem. If a bee or fly comes into your room, the only way for it to get back outside is the way it came in. If it came in through the doorway, and looks for the solution at the window, it will die there, hitting the window again and again. This is the feeling I get from looking for solutions in the wrong places. Just off the top of your head, how many examples can you think of where things are made worse by searching for a solution somewhere outside the problem? If you have a relationship problem, is looking for the answer in the arms of another really going to make things better? If you’re stressed or lonely or bored, is there really any long-term relief in repeatedly looking for comfort in a bottle, a pizza box, or the internet? Ultimately, it arose from this foundation, so that’s where we have to return it. Awakening is to know your root. It’s got a lot of names, but it’s that which is your source and destination, your sustenance and support. Sometimes I feel like people (unconsciously) misunderstand awakening as a blissed-out feeling, or a clear(er) intellectual understanding of what’s really going on in the world. This is probably there, to be sure, but this isn’t the main thing. Your root is your source and your refuge. To paraphrase the words of the Sixth Patriarch, “Who would have guessed that my foundation was inherently complete, endowed with every kind of knowledge and ability, and able to perceive everything and respond appropriately through both the spiritual and material realms.” This root of ours is the source of all energy, wisdom, courage, compassion, and is continuously taking care of everything. It seems that only our clinging and insistence on relying upon “me” and “my” thoughts and ideas can hinder it. Daehaeng Kun Sunim gives the example of assigning a task to someone: if you give them a job, and then constantly bug them about how it’s going, they’ll throw the job back in your face. “Here, you do it!” Or, if you keep calling to them and asking how it’s going, or give them something new to do every few minutes, how can they set about getting the task done? What we know, along with what we don’t know. What we understand, and what we don’t understand. Things that go well, and things that are going badly. We have to entrust both sides, otherwise we end up (trying to) cling to those aspects that represent our fixed ideas of good and bad, pleasant and unpleasant. Roy, at Return to the Center, asked “how to discern entrusting to my foundation / Buddha-nature from entrusting to my ego-driven storyline? Trust me on this – I have a very convincing storyline…” This is a great question, and I think this unconditional entrusting is a huge part of the answer. Somewhere in letting go of what I know and what I don’t know, I transcend this storyline. If (when!) I find myself caught up in the storyline, I let go of that too. Similarly, how do we know what we’re feeling or sensing from within is arising from our true nature, versus our bad karma? This one isn’t easy. For one thing, we have to let go of even the things that arise from inside. Both the good and the blissful, and the wise. If they are true, they’ll return when we need them. Another sign is the tone of this inner “voice.” Is it something that violates the precepts? Is it something harsh and cruel? Something argumentative or spiteful? Those are really strong indications that what I’m sensing is just a karmic echo. No need to feel bad about them, just let go of them too, and don’t be deceived by them any longer. Whether we see it or not, whether we can feel it or not, our Buddha-nature is there taking care of things. 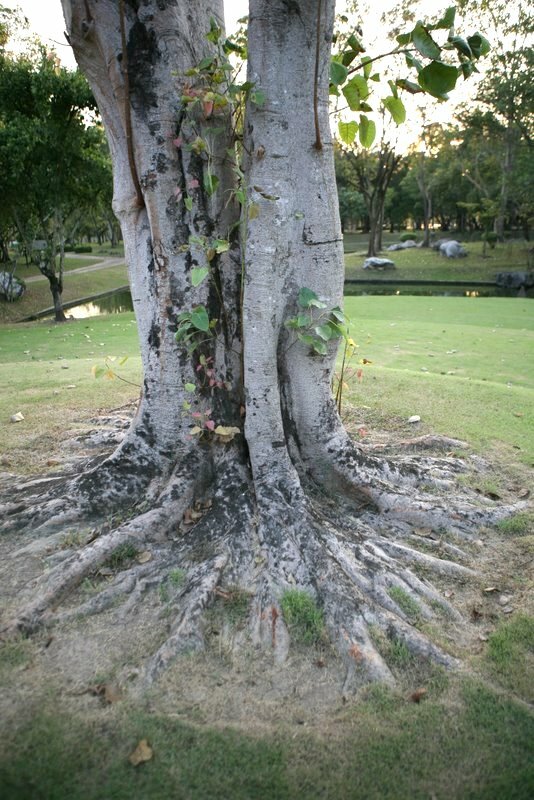 You don’t see the root of a living tree, yet it’s there supporting and feeding the tree. So a lot of what entrusting is, is simply getting out of the way and letting it work. Even when I don’t know it’s there, it’s still there, supporting me and sustaining me. Every breath, every cycle of our blood, every exactly produced hormone and enzyme is a miracle of the highest order. A 100 billion lives are magically working together within just this one body. Entrusting is a step off a hundred foot bamboo pole. It’s stepping beyond my own fixed ideas. It’s dying and traveling through that gray land where there’s nothing to grasp onto. However, for eons we’ve mistaken “I know,” “me,” and “mine” for a support, for something safe to stand on. You think that floor is safer? 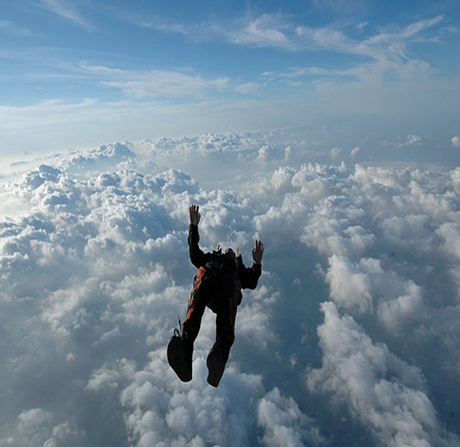 Far more skydivers die in plane crashes than skydiving accidents. 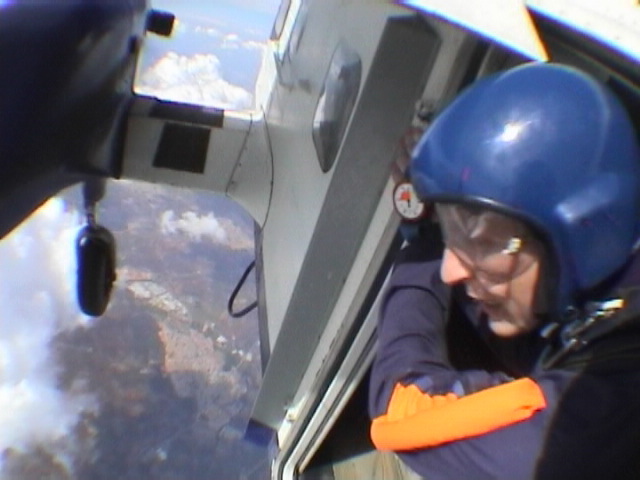 You’re safer out of the plane than you are in it! It was truly said that when you let go of everything you gain everything. When you’ve let go of all dualities, you become a channel for all the creativity, love, and wisdom in the universe. There are so many aspects to entrusting that it’s hard for me to address them all, and my own practice is still incomplete (by a lot!) so if there’s something I haven’t addressed, let’s go ahead and discuss it in the comments section. Thank you, this is very helpful to me right now – I am stepping off into that gray area every day and sometimes it is easy to forget that there is something there – the root in the background. The first No River to Cross Dharma talk I attended was on the chapter about dealing with the different stages of enlightenment. (maybe chapter 9?? I’ll have to get another book!) I remember the discussion after the reading being very quiet. Joe pointed out that it was hard to say much because nobody was at the level of understanding that was being discussed. This feels a little similar. I think most of us must have a sense of our roots, there’s a lot of soil that needs to be meditated through. We aren’t generally told to listen to our roots very often, so it seems strange at first, we might not even know where to find them. The better sense we get of our roots the more we can understand. Thank you so much for this post. I’ve read this post three times today, once while on a short break at work.. I’m going to need to read it several more times and let it sink in before I have further questions / comments. I am very fortunate to have found W.U.a.L.! Yes, may I echo the other comments here? What a wonderful post with so much to think about – and try out! Thank you. What a great insight that is, to see ‘my’ life actually being made up of countless lives all working together! And then, of course, to see how I am just one small life in a still bigger picture of interconnected lives. Amazing. Thanks for that:)! I think that there are only so many words I can try to read and conceptualize, and then I just need to let go (put it to practice). Yet, somehow your words helped me as my delusions build again…. I liked your analogy of sky diving and, “…you think that’s ground you’re standing on right now?”:)! You mentioned that letting go is the second most important thing. What is the first? Ah ha Rachael! You caught that! You’re the only one so far.^^ I’ll have a post on that before long. The most important thing is Juingong, which is emptiness. Sorry, Chong Go Sunim.. I answered Rachel’s question without getting your permission. Actually, it’s not, if you can believe it, but that wasn’t a bad guess! Thank you for this engaging post, Sunim. I’ve read it twice over the past few days and am still absorbing it. Two questions came up as I read it today. I’ll just jump in with my experiences and what I’ve learned from my teacher. Wisdom arises when we’re in touch with our true self. Daehaeng Kun Sunim has often said that we all are innately endowed with all the wisdom and abilities of the Buddhas. Thus, the source of all wisdom is already within us, waiting for us to get in touch with it. Similarly, I’ve found that one has to be careful in learning to listen to this wisdom. First, we have to really try to put it into practice when we do become aware of it. Otherwise, my awareness of it seems to dry up. Second, we have to be very careful not to mistake the voice of karma for this wisdom. So if there’s a lot of “I” in it, unharmoniousness, desire, blame, fear, vindictiveness, or things that violate the precepts, then that’s a good inidication to me that it’s what’s called in korean a karmic echo. (A karmic state of consciousness. That is, a state of thought or emotion that was recorded as karma, and is now returning, and its appearance may have nothing particular to do with what’s before me right now.) When I see these kinds of things trying to pass themselves off as wisdom, I just give them a friendly hug and entrust them as well. One other thing, having tried to apply the wisdom that’s arisen, it’s also very important to entrust the outcome of that as well to our fundamental mind. Again, otherwise I wind up getting lost in the fixed ideas of my “ideal” outcome. In terms of kong-an’s and wisdom, to me, it’s because practicing with them takes one outside the realm of the discriminating intellect, and so resting this habit opens a hole through it’s crustations, allowing this wisdom of our inner, Buddha-nature to rise to consciousness. Sunim, I haven’t forgotten your response, but am just now getting a moment to reply. First, thank you so much for your kindness in writing at length on this topic. May we always be careful in using our precious lives to respond to the moment’s requirement!